Posted on Sat, Mar 17, 2012 : 2:48 a.m.
Aral Gribble, left, and Drew Parker and "Dead Man's Shoes." While taking a college course on movie westerns, I quickly realized that the ones I enjoyed most (like “Rio Bravo”) featured some music and a sense of humor. And indeed, Joe Zettelmaier’s new, theatrical take on the western genre, “Dead Man’s Shoes,” now having its world premiere at Performance Network (a co-production with Williamston Theatre), has a healthy dose of both elements. Yet in the end, I’ll confess that it’s a show I occasionally admired more than I loved. Set in 1883, the two-hours-plus show opens with a dishonorably discharged Army cook, Froggy (Aral Gribble), in a jail cell next to a darkly taciturn, menacing outlaw named Injun Bill Picote (Drew Parker). When the sheriff (Paul Hopper, in one of several roles) gets a telegram and essentially invites the men to escape, they strike out together, and Froggy learns of Bill’s mission: to track down and kill the governor of Wyoming, who made (and wears) a pair of shoes made from Bill’s former friend, who’d been lynched for a crime that Bill committed. The Network’s performance space has been re-configured for “Shoes” as a thrust, with rows of seating on the sides. The first thing patrons will notice is Kirk Domer’s clever set design, which employs a giant, vertical scroll that Hopper and his multi-character partner-in-crime Maggie Meyer crank between scenes to alter the backdrop. Given the number and broad range of locations used in the play, the device provides an efficient and appropriate solution. Amber Marisa Cook’s costumes - particularly the versatile clothes worn by Meyer and Hopper to accommodate quick changes - hit the right notes, both in style and palette, and Daniel C. Walker's lighting design skillfully underscores the play’s emotional ebbs and flows without drawing too much attention to itself. Director David Wolber, meanwhile, guides the story with an eye for (sometimes subverted) genre conventions as well as comedy. A couple of moments feel emotionally overwrought, but overall, Zettelmaier’s story is in good hands. Hopper and Meyer do excellent work in multiple roles (and they sing song verses that help tell the story of Injun Bill between scenes), and Parker, from his swaggering walk to his ready-for-any-threat posture, exudes Bill’s gruff, lone wolf resoluteness, except during the rare moments when Bill lets his guard down (his conversation with a prostitute that doesn’t understand English, for instance). Gribble, despite playing the genre staple sidekick, is ultimately the show’s beating heart. For Froggy is the goofy, self-effacing, lovable clown to Parker’s straight man - as evidenced by lines like, “I’m a fast learner! No, that’s not true. I’m not very bright” - and he’s also the character the audience most relates/responds to. Indeed, Zettelmaier wrote the part with Gribble in mind, so it’s hardly a surprise that the casting seems a perfect fit. So with all this going for it, what are “Shoes”’ shortcomings? Well, the story relies on some big-time coincidences that feel a bit forced, even for a genre piece; and there’s also a seemingly contrived crisis point, wherein (spoiler alert - skip to the next paragraph if you don’t want a surprise ruined) Bill struggles with whether or not to kill a female character he finds wearing the shoes made from his friend. Though Bill’s original mission was to kill the person wearing the shoes, wouldn’t this only make logical sense, and thus serve the cause of justice, if that person was the one who had the shoes made to start with - not some woman who unwittingly found them? 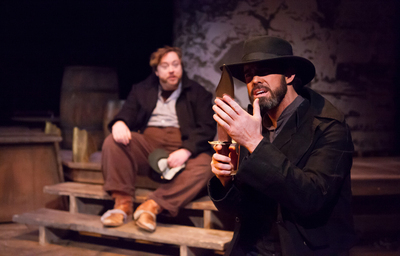 "Dead Man's Shoes" continues through April 8. For more information, see the AnnArbor.com preview or the Performance Network website. Tue, Apr 10, 2012 : 8:03 a.m.
Have heard nothing but RAVES- SO sad I didn't get to see it due to unusually hectic schedule - Is it going on tour because I would travel to see it!!! Wed, Mar 21, 2012 : 10:33 p.m.